Aviation artist Mike Machat recently completed nose art on the 419th Flight Test Squadron’s B-52 #60-0036. About 50 years ago, the bomber was used in a top secret test program named Tagboard. The program involved testing the D-21, which was a ramjet-powered reconnaissance drone that could reach Mach 3 speed. 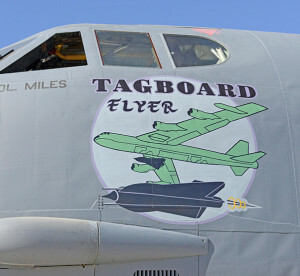 A B-52 Stratofortress from the 419th Flight Test Squadron at Edwards Air Force Base, Calif., is sporting new nose art to commemorate it’s storied past. Renowned aviation artist Mike Machat completed the artwork earlier this month on B-52 #60-0036. Machat recently completed nose art on an Edwards B-1B Lancer and was again commissioned by the 412th Test Wing for this project. About 50 years ago, the bomber was used in a top secret test program named Tagboard. 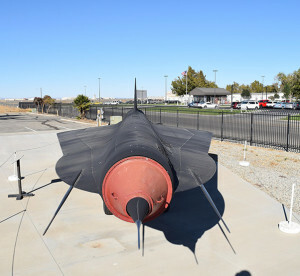 The program, which has since been declassified, involved testing the D-21, which was a ramjet-powered reconnaissance drone that could reach Mach 3 speed. The new nose art is a re-application of the original work, which has since been painted over following routine maintenance, according to Master Sgt. David Peralta, 912th Aircraft Maintenance Squadron, Bomber Aircraft Maintenance Unit superintendent. According to Air Force Test Center History Office documents, all manned flights over the Soviet Union were discontinued by President Dwight Eisenhower after Francis Gary Powers’ U-2 spy plane was shot down May 1, 1960. While the U.S. government was planning on using satellites for reconnaissance, the technology was still a few years away and the Central Intelligence Agency determined unmanned drones could fill the gap until satellites became viable. The D-21 required a mothership to launch given its ramjet engine, which needed to be air-launched at a certain speed to activate. Initially, Lockheed testers used an M-21 (essentially a modified SR-71 Blackbird) to air launch the D-21 drone. The D-21 would be launched from the back of the M-21. 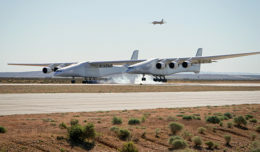 Ideally, after conducting its reconnaissance mission it would eject a hatch with photo equipment to be recovered either mid-air or after the hatch landed. A D-21 reconnaissance drone is on display at Blackbird Air Park at U.S. Air Force Plant 42 in Palmdale, California. The D-21 was a ramjet-powered reconnaissance drone that could reach Mach 3 speed. Ideally, the drone would air launch from a mothership and after conducting its reconnaissance mission it would eject a hatch with photo equipment to be recovered either mid-air or after the hatch landed. However, on the fourth flight test, the D-21 experienced an “asymmetric unstart” as it passed through the bow wake of the M-21 causing the mothership to pitch up and collide with the D-21 at Mach 3.25. 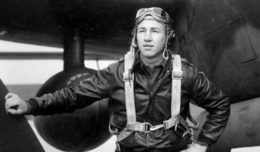 Crewmembers Bill Park and Ray Torick ejected from the M-21, but Torick’s flight suit became ripped and filled with water when he plunged into the ocean where he drowned. After the accident, the M-21 launch program was cancelled but testers still believed the D-21 would make a valuable reconnaissance vehicle and decided to launch the drone from B-52Hs, one being #0036. The new code name for the D-21 project became Senior Bowl. After several failed launch attempts, the first successful D-21 launch from a B-52 occurred June 16, 1968. The drone flew 3,000 miles at 90,000 feet. After a few more flight tests, the CIA and the Air Force decided to conduct four operational launches that all ended in failure in some way. Two flights were successful, however the imagery could not be recovered from the D-21’s hatch. The other two operational flights ended with one being lost in a heavily defended area and the other D-21 simply disappeared after launch. The D-21 program was cancelled July 15, 1971, and both B-52s used for the program were returned to operational Air Force units. The B-52 #60-0036 currently assigned to the 419th FLTS at Edwards, arrived in 2001 where it has been used as a test bed ever since. A B-52 currently used for testing by the 419th Flight Test Squadron, sits on the flightline at Edwards Air Force Base, Calif., Oct. 16, 2017. The bomber, tail# 60-0036, was used in a top secret test program that began with the code name Tagboard. The program involved testing the D-21, which was a ramjet-powered reconnaissance drone that could reach Mach 3 speed. The D-21 would be launched from underneath the wings of the bomber. “Most of these maintenance and operations units, and many of these old planes, have a storied past. 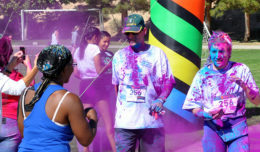 It is great to be able to embrace that heritage and history, while sharing it with the next generation,” Peralta said. Peralta added that the artwork also was done in conjunction with the 419th FLTS’ 75th anniversary of existence.